At CES, Intel may have been keen to insist that the whole Meltdown and Spectre fracas will be largely put to bed by the end of next week, but it appears more havoc is being caused right now, with Microsoft’s Windows patch aimed at tackling the flaws causing AMD-powered PCs to stop booting up. Update: AMD has released the following statement about the issue. "AMD is aware of an issue with some older generation processors following installation of a Microsoft security update that was published over the weekend. AMD and Microsoft have been working on an update to resolve the issue and expect it to begin rolling out again for these impacted shortly." This is only affecting some AMD machines, but clearly enough have been hit, because Microsoft has made the decision to halt patching AMD PCs in order to resolve the problem. Speaking of which – what is the problem? 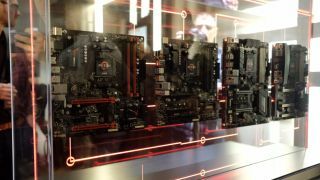 It lies in AMD’s documentation for its CPUs, Microsoft asserts, which is erroneous in some respects, and whatever differences there are between the documents and reality of AMD’s processors are serious enough to have caused affected machines to fail to boot. As the Verge reports, Microsoft issued a statement to say: “Microsoft has reports of customers with some AMD devices getting into an unbootable state after installing recent Windows operating system security updates. So, as mentioned, the blame appears to lie firmly with AMD, although we’ve yet to hear a response from the chipmaker itself. Though you might also argue that Microsoft’s pre-patch testing should have stumbled across the issue, perhaps, given that it seems to affect a fair number of AMD-powered PCs, judging by reports across the net (which also seem to suggest that it’s older AMD CPUs that are more likely to be affected, in the main). For the full details on the block put on the update, check out this Microsoft support post. There are also some handy links which may help in troubleshooting PCs that have been rendered unbootable. Microsoft says it’s working with AMD to resolve the issue as soon as possible, but for now, all AMD processor owners can do is wait. Meanwhile, you can always check out our guide on how to protect against the Meltdown and Spectre bugs.